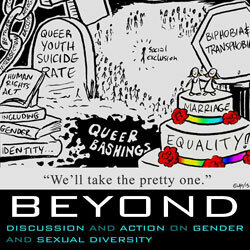 Audio from the session: Invisible sexualities within queer communities. New Zealand is getting used to gay and lesbian identities as alternatives to straight, but has little appreciation of a wider diversity of identities including but not limited to bisexual, pansexual, asexual, polyamorous and more. How do people deal with the additional stigma of being made invisible? How difficult or risky is it being open about who you are when even some other queer folk deny your existence?